After months of contractual turbulence and cuts to funding, a new purpose-built shelter for victims of domestic violence, located near Tel-Aviv in Israel, opens its doors to women and children. 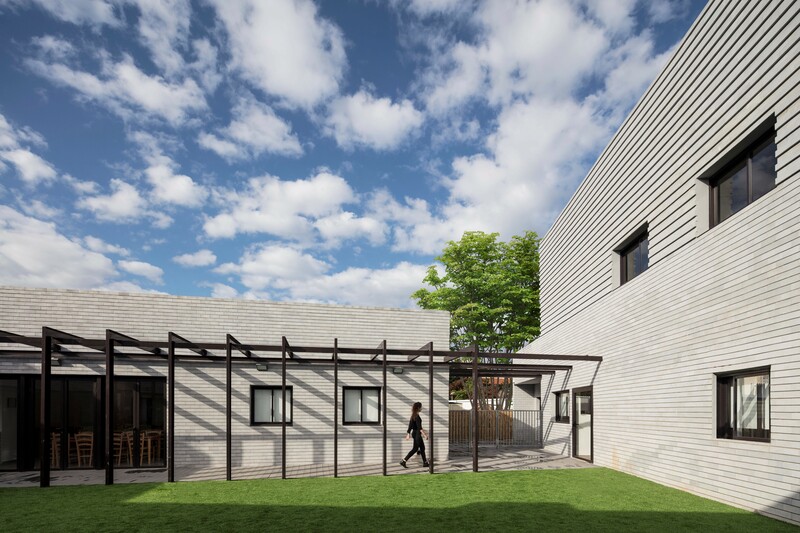 Amos Goldreich Architecture: Centre for Victims of Domestic Abuse in Israel from Stephenson / Bishop on Vimeo. Led by pioneering human rights activist, Ruth Rasnic, for international charity ‘No To Violence’, the facility will provide a much-needed refuge for distressed and abused women and children from all localities and backgrounds. According to World Health Organisation data up to 45% of women in Israel, like most countries in the west, will be victims of domestic violence at some stage in their lives and recent statistics indicate that 45% of children in Israel are subjected to violence. This is a worldwide epidemic. 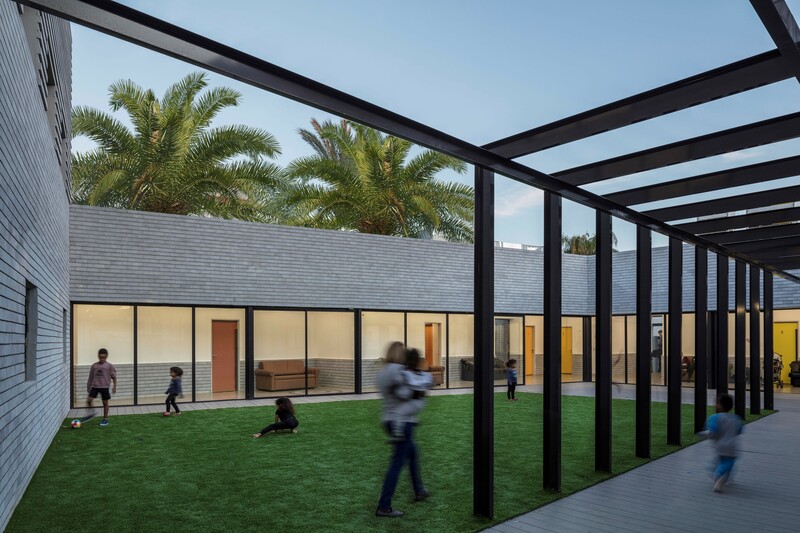 Designed by London-based practice, Amos Goldreich Architecture, alongside local firm, Jacobs-Yaniv Architects, this shelter is one of only a handful in the world which has been designed and built in consultation with the staff who will occupy and run it. The charity currently operates three shelters, and whilst it foots 60% of ongoing expenses, the government does not assist with building expenditure. 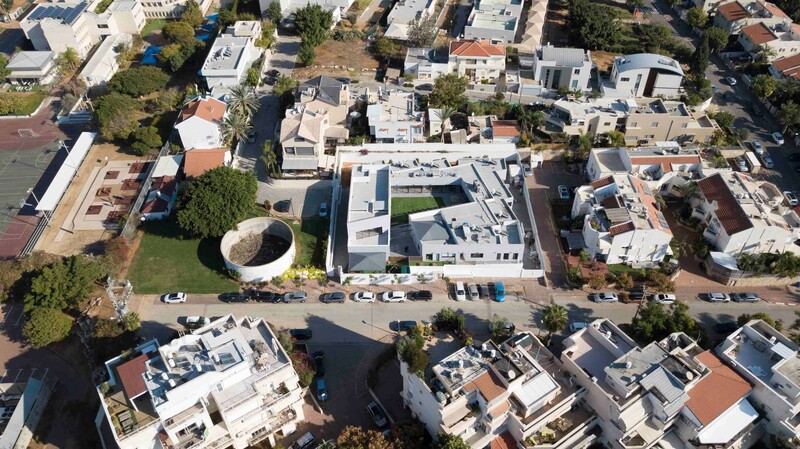 The site for the shelter measures 1600 square metres, is located within a quiet residential neighbourhood and surrounded by a mix of private residential houses and blocks of flats. The brief specified a location within reach of local community resources, i.e. stores, jobs, health clinics, schools, parks and other green spaces, counselling centres and recreational facilities. The new shelter replaces an existing one in the same city which was established 37 years ago. Like the majority of existing shelters in Israel are not purpose-built. Located in converted buildings, they are overcrowded, with too many stairs and blind areas, compromising the safety of the residents. The new brief thus called for a totally secure and sheltered building - a peaceful haven that would give its inhabitants a sense of home. The site for the new shelter was provided by the local municipality, but this proved a challenge, as local neighbours objected to it. Numerous consultations with neighbours and the municipality took place, including reviews of the residents' legal objections to the scheme by the High Court which went on for six years, before it ruled in favour of the shelter. The architects were given two briefs: one was set out by the Ministry of Social Affairs, the other, which complemented it, by the charity. 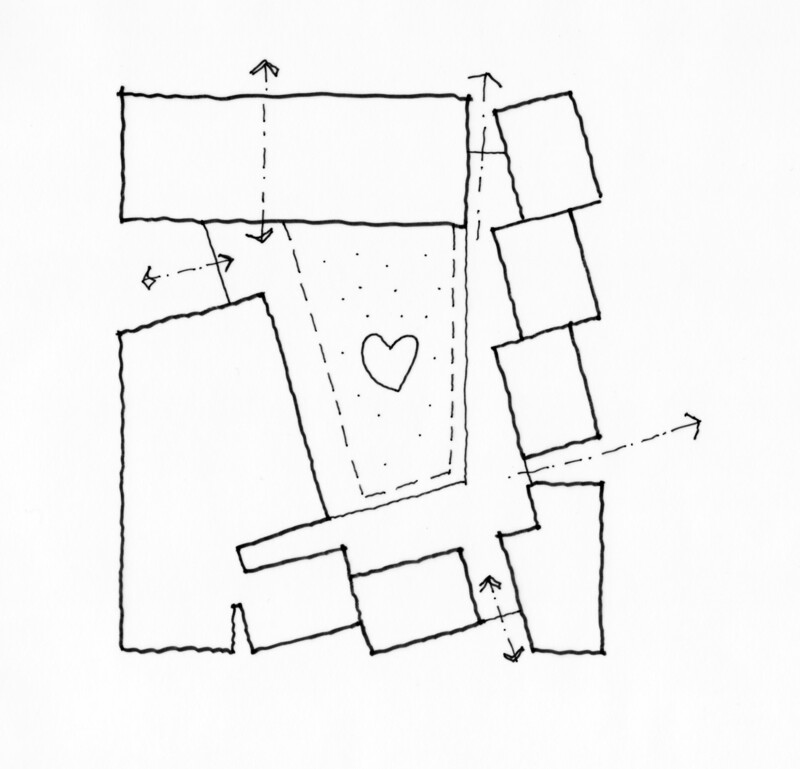 The charity was very involved in the development of the brief and the design discussions, stipulating that the shelter needed to accommodate up to twelve families, all of whom require individual privacy, yet need to coexist with each other and with the staff who look after them. Each family has three children on average, so the design of the building was predicated on a floating population of more than 24 residents at any one time. Another paramount request was to create a sense of home and security for the inhabitants, without it feeling like a prison. 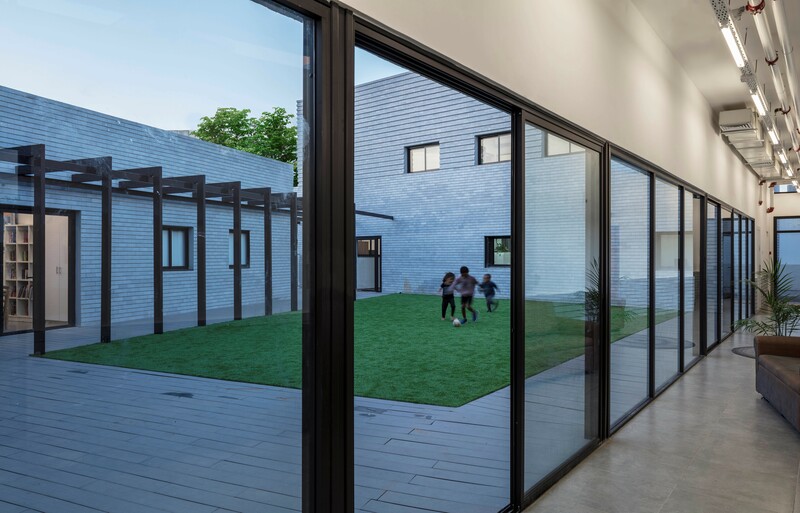 For safety reasons, residents spend most of their day in the shelter, and so the major design challenge was how to accommodate all families in a peaceful manner for extended periods of time. The very limited budget was a challenge from the very beginning. On arrival at the shelter, each new family is given a small ‘house’ that is part of the larger building. 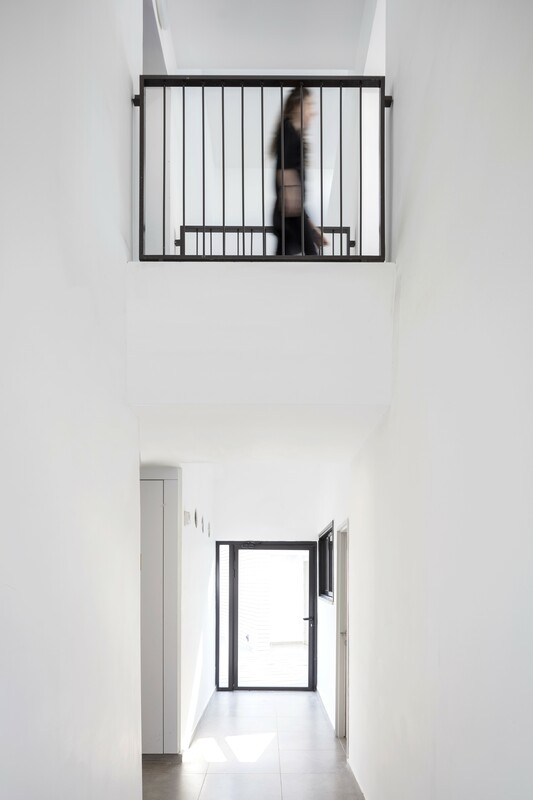 In order to allow the families to conduct a normal daily routine in the shelter, the ‘houses’ are separated from the communal functions and connected by the internal corridor. The nursery is physically separated from the larger building, which allows it to function as an ordinary nursery would, allowing women to drop their children off in the mornings, and collect them later in the day. The shelter houses a diverse range of functions - communal areas, a kindergarten, a computer room, laundry facilities, kitchens and a refectory, independent living quarters for each family, staff accommodation, office areas for the shelter’s manager and staff (including social workers, a child psychologist, housemothers, a child care worker, and a part-time lawyer). There are additional professional workers: psychotherapist, drama or arts therapists, as well as volunteers such as cosmeticians, hairdressers, reflexology and martial arts practitioners, and others helping children with their studies and computer skills. Within a short while of being taken in at the shelter, children are referred to local schools (only after the mother obtains temporary child custody). Women come to shelters from different locations and so the building creates a caring and safe basis of change for residents who choose to stay. They receive empathy and compassion, legal aid, medical direction, help in locating new homes and assistance with basic furniture and equipment. The charity and staff make a dramatic change to the women’s self-esteem. 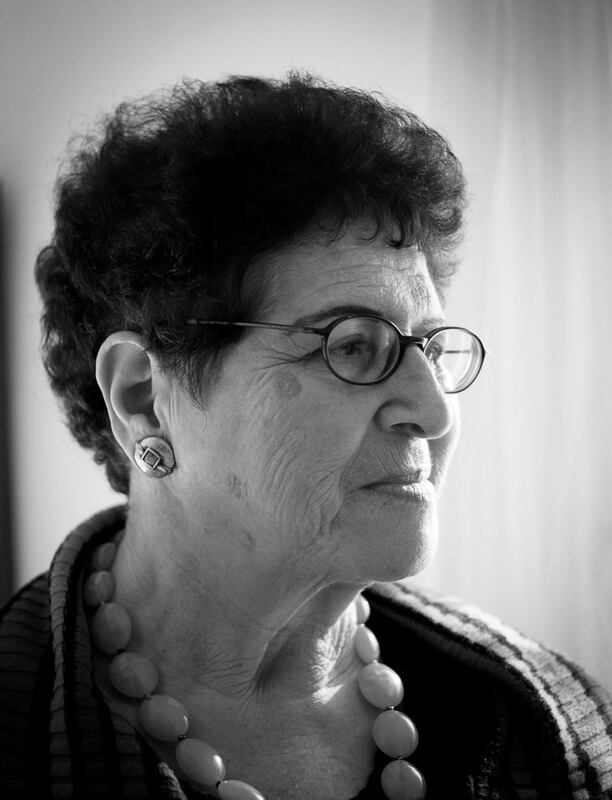 Ruth Rasnic, the charity’s founder, said: “ The shelter will provide a much-needed refuge for abused women – they arrive in a state of real distress, these people have deep psychological problems, as do their children, so the shelter must provide them with a tangible sense of calm and security. The architects have created a miracle, really, a place where people of disparate backgrounds can come to terms with their individual trauma, where we can help rebuild their lives, give guidance and support during a key period of transition. And we have many success stories. This is just one example of the work achieved by ‘No To Violence’. This new shelter will make a huge contribution to the ongoing work of our charity." 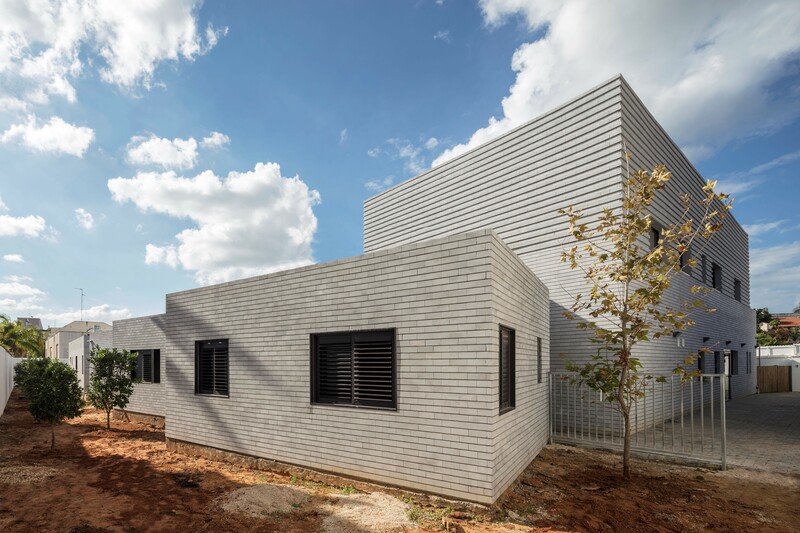 Sadly, this is one of only few examples of a purpose-built shelter in Israel and elsewhere in the world which was designed with input from the staff who will run it in order to address the specific needs of its residents. Amos Goldreich’s aspiration is that it shows the possibility, despite limited funding in this sector, of producing a beautiful and functional building, worthy of its inhabitants and employees. The shelter is named after Goldreich’s mother and grandmother, ‘The Ada and Tamar De Shalit House’. Main contractor - Efrata 2003 Ltd. Engineers - Tweg Engineers Ltd.
Amos Goldreich Architecture is a London based architectural practice with an international reach, specialising in buildings that provide enlightened and inspiring shelter for those inhabiting them. They deliver award-winning design and expertise to all projects from a private residential scheme for a private client, to a domestic violence refuge centre for an international charity. Every project is approached with a personal service and rigorous attention to detail, programme and budget. They are uniquely placed to add value to our client’s project by listening, collaborating and never imposing a preconceived idea or style. Clients choose us because we are open minded, thoughtful and trustworthy. 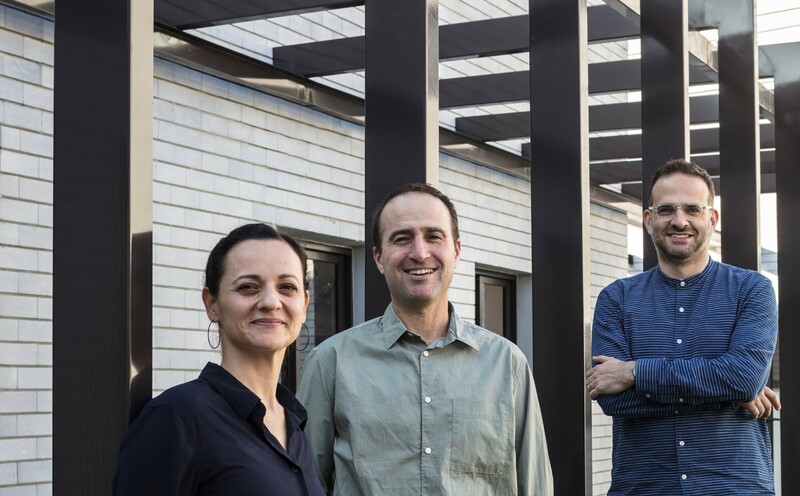 Their objective is always to marry the pragmatic with the aesthetic in a way that results in buildings and places that have a positive impact on people’s lives and are a joy to experience.